This entry was posted on December 23, 2014 by Jessica Anderson. Unique, Pretty, and A Good Value. That's what sets this award apart from all the others. Our 2014 Product of the Year - Swirl Egg Art Glass. 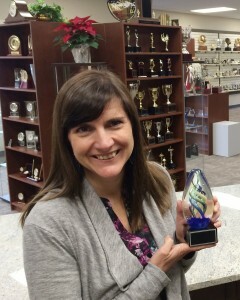 The Swirl Egg Art Glass Award by Tropar Manufacturing wins the Trophies2Go 2014 Product of the Year. Nominated by our Production Manager Tom, he chose this award because of the high quality and very affordable price. Tom also likes how Tropar keeps our local warehouse well-stocked with this award, which is a good thing, as it's a hot seller! 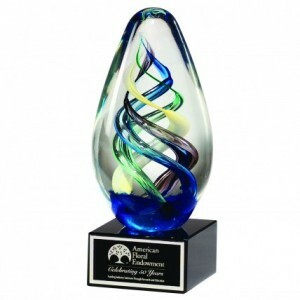 This beautiful hand-blown award features swirls of purple, blue, green, and yellow suspended in clear glass, attached to a black crystal base with a personalized aluminum plate on the front. At $39.00, it's a great value for such an impressive and artistic award! Here's what a customer had to say: "This item was ordered to present to three community members for their efforts contributing to the health of the community-at-large. The presentations were made at a large public event and photos of these awards showed up in the newspaper." "I was thrilled with the quality of these awards! You would think these awards were much more expensive than they are and I believe they are worth more". I'm modeling our winning Egg! Thank you to our vendor Tropar, who not only creates this art glass award, but also supplies us with many of our top selling acrylic awards and premium plaques. They are a great company with excellent leadership, outstanding customer service, and many 'Made in the USA' products. We are proud to carry Tropar's high quality and beautiful awards in our online catalog and especially proud to feature the Swirl Egg Art Glass award as our 2014 Product of the Year! For past Product of the Year winners, check out our 2012 Monster Trophies and 2013 Honey Badger Trophy.